As soon as I walked into the room, I could smell them. Sour, pungent, aromatic…the hops’ scent was filling the air to the rafters! I had been invited to attend a “hop rubbing” event at Shakespeare’s Head just off of Carnaby Street in honour of Marston’s new single hop ale releases but I really had no idea what to expect. It’s not every day someone asks you to come and rub hops with a roomful of people! The new releases are the latest ale experiment from Marston’s – the brand which owns pubs and breweries countrywide, making drinks such as Pedigree and Burton Bitter. 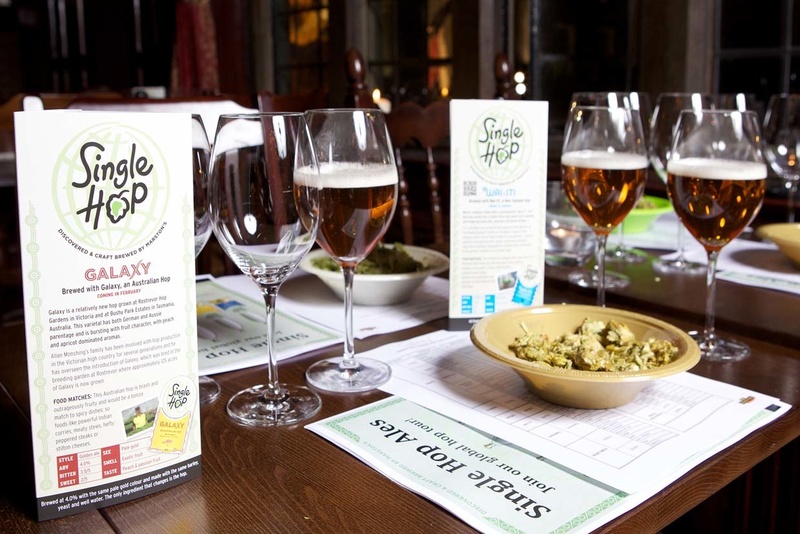 The Single Hop Ales have been created as a way to see how the various flavours of hops can change an individual beer when every other factor (from the type of yeast used, to the water, brewery and barley) stays the same. Each month in 2012, a new variety is being released. January used a New Zealand hop called Wai-iti, while February’s release was made with Galaxy from Australia. March will showcase the more traditional English East Kent Golding hop. The idea came because the team at Marston’s was curious to see what would happen if they focused on just one hop at a time. 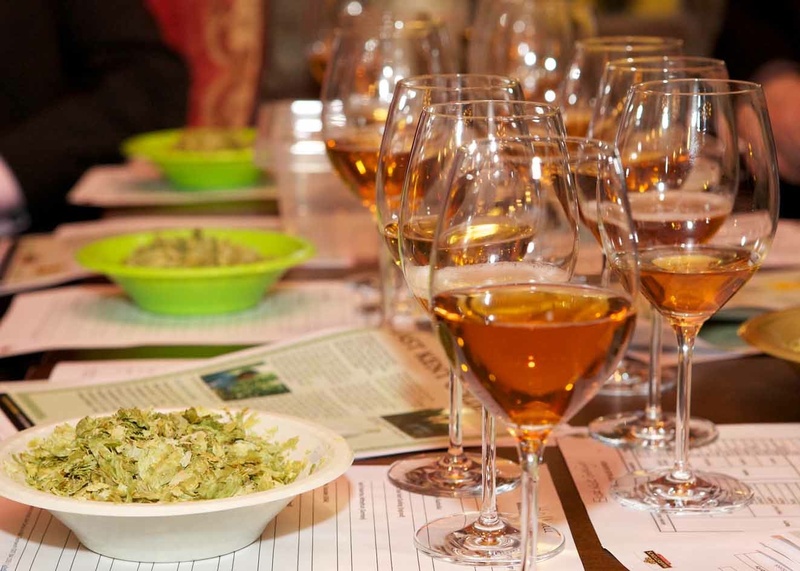 According to one of the speakers, Paul Corbett, the UK has a fairly limited style of hop because people here have always drifted towards the best bitter flavours entwined in the Golding and Fuggle varietals. But, by trying out different hops and highlighting their individual flavours, the team hopes to increase interest in how varying ales can be made from each. I had little idea about hops before I came to the event. I drink a lot of beer, so know about their production, and my English family come from a big hop growing region in the UK (Herefordshire) but I’d never been quite so up close and personal with them. But before I continue, I should probably explain a bit more about the humble hop. Reference has been made to using the plant as far back as the year 622, although the routine use of hops in drinks here in the UK didn’t come about until the 15th century when the British learned brewing techniques from Flanders. By the late 19th century, a massive 72,000 acres of hops were being cultivated to satiate the public’s taste for beer. That has dropped to around 2,500 acres here in England while Germany remains the top grower in the world. 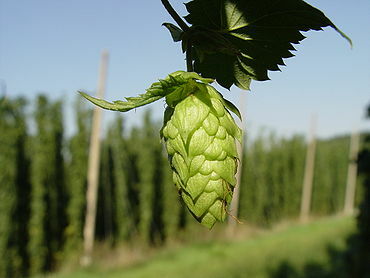 Hops are related to the cannabis plant and grow up to nine feet. There are male and female plants but the cone needed for harvesting is only produced by the female. The cones have lupulin glands, which are sticky and look like pollen, and contain the oils needed for beer production. After they are picked, they are dried and packed into bales for dispatch to breweries to process. Once at the brewery, a proportion of the hops are added into the kettle, along with the wort (made from the milled barley which has been mashed up with water and strained) and boiled. Depending on the required flavour output, more hops may be added towards the end of boiling (called late hopping) and to the final cask (called dry hopping). That night, I tried the three latest releases and rubbed a total of six hops. The amazing thing was how diversified hops smell. The East Kent Golding, for instance, reminded me of haystacks, grass and hemp, and had a bitter aroma, while the Galaxy had undertones of licorice, pepper and cedar. Marynka (a variety from Poland) had a strange combination of onion, mint and medicine smells, and the German Hallertau Mittelfruh conjured up aromas found in a bubbling pasta sauce: herbs like thyme and oregano. After all those intense and pungent fragrances, I suppose I was a little disappointed with the flavours that were then to be found in the ales themselves. March’s East Kent Golding was just a regular, classic bitter, and so felt a bit flat in comparison with the fresh hop. But, I did enjoy the January Wai-iti, which mirrored the zingy, bursting citrus notes in both the taste of the beer and smell of the hops. It’s an interesting experiment all around. Simon Yates, a master brewer with Park Brewery in Wolverhampton, told us they would be keen to play around with only those hops made in England to replicate this experiment with only English varieties. However, that will still be a while off because it takes three to four years for a new hop varietal to be created and tested before finally being used in production. Nevertheless, if you do get a chance to head to a brewery and rub down some hops, I highly recommend it. Just make sure to take a wet-wipe as they get rather sticky, which is equally unpleasant. And, be prepared to smell hops for many hours afterwards as their crafty essential oils love getting absorbed into the skin. Marston’s Single Hop Ales are available at Chef & Brewer and Taylor Walker pubs throughout 2012. That sounds like so much fun! During the Spring or Summer of last year, the Boston Beer Company, makers of Sam Adams beers, released a 12 pack that they called the Latitude 48 IPA Deconstructed. Their Latitude 48 IPA is made using 5+ hop varieties. The Deconstructed was a series of 5 different beers brewed from each individual hop and then packaged along with the Latitude 48. We did a panel tasting last year, and I must say, it was amazing to see how much variability there was between different hop species. You are absolutely correct about the Kent Goldings. They were definitely the mildest variety (dare I say boring?). The German hops were bright and aromatic. And the Washington State hops were big, bold, and somewhat aggressive. It was a great experiment and truly showcased the amount of talent that a true master brewer needs to have. I believe Mikkeler has also released one hop beers that showcase the individual characteristic of different hop varieties, but I have yet to try them.